Zasu & Thelma go out with two idiots to a nightclub. ZaSu falls for a wrestler, drags Thelma to his next fight. After running their car off the road, a society matron insists that the girls spend the evening at her mansion. During WW1, the girls become spies when they spend the evening with two German officers. The girls are stewardesses on an experimental flight. The girls buy a country home that turns out to be a sand trap. Thelma and Zasu go to a Turkish bath to try to get rid of a cold. Instead of delivering some fancy dresses to a customer, the girls wear them to a party. The girls moonlight as taxi dancers in order to earn some extra money. 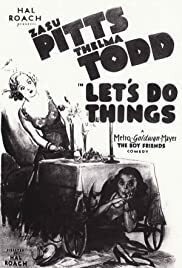 This is a quite enjoyable 26 minutes, the first of the Thelma and ZaSu series.Jerry Mandy as the doctor is very funny and almost a clone of Jimmy Durante.Also present for Laurel&Hardy fans are Harry Bernard and Charlie Hall as waiters and Dorothy Granger as the leading Night Club dancer.The cigarette girl in the nightclub is Mary Kornman who is often mistaken for a different unidentified actress who appears briefly in the Thelma/ZaSu shorts Maids a la Mode,Alum and Eve and also as a bridesmaid in L&Hs Me and my pal.The nightclub manager is Maurice Black who appears in Bonnie Scotland.Even without the L&H connection this is well worth seeing.